I've been doing a bit of sewing around here for my Online Home Ec class. My first project was fun (except for those horrid napkins!) but these two projects were even better. 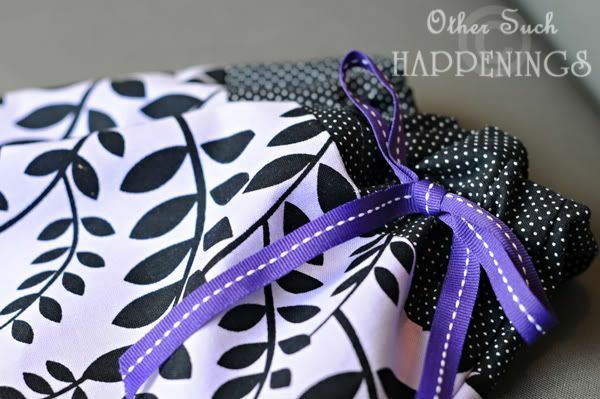 I love the combination of this black and purple fabric with the dotted fabric. The purple shows up white in pictures but it really is a beautiful light shade of purple. If I were to make this bag again, I would make the top band of fabric much wider. It seems a little odd with its current proportions. Ruthanne even has a limited edition camera slip cover in her Etsy shop made of the same material. Great minds think alike! Next up we have two bags that I made for my boys. Please notice the X-joints on the handles that give the bags extra strength and durability. Noah picked out this Scooby-Doo fabric. While Austin chose the vintage airplanes. Note from Austin and Noah: These are NOT purses! Boys don't carry purses. That is why we are holding them close to the floor and mom is forbidden to take a photograph of them slung over our shoulder like a purse. Because they are NOT purses. That is all. Would your man ever carry a "man-bag"? No way would David ever carry one of those, although he is a great husband to hold my purse for me on occasion. :) He also preferred more manly diaper bags when our boys were little... no teddy bears or fru-fru bags allowed! I know they have a lot more stylish options available now than they used to, but back in the day it was hard to find plain and simple bags. We would often search for messenger bags to use as diaper bags. GREAT job! Love the planes. Great job.. love the bags.. you are starting to look like a pro! I also have some of that vintage airplane fabric. I made a high chair cover with it. My hubby would not be caught carrying a "man bag". He would carry the diaper bag (no matter how frilly), but that's about it. He does have a backpack that he takes hunting though. I have made my boys totes similar to yours. They use them as library bags. I agree with Angie - library bags would be the perfect function. You did a great job - I'm really impressed!!! I especially love the fabric choices on the top bag!! I can't wait to see all of your projects - You're doing great! look at you go!! those bags look great. Great job! I'm really diggin' the vintage airplane fabric. THAT'S my favorite. :) I love you! Those bags look great! I made bags for my boys once. Sad looking camo backpack bags from old bdu's so they'd have lots of pockets. But once again they were NOT purses. Nick wouldn't carry a "man purse". And when we carried a diaper bag we got it from the hunting dept. It was realtree camo and durable! Great looking bags. I probably won't date a man that carry a man's bag. LOL. But he's a good guy and holds my purse for me when needed. Ummmm... He probably would not. Maybe a backpack but that is all. But your bags look good. What will your boys use them for? 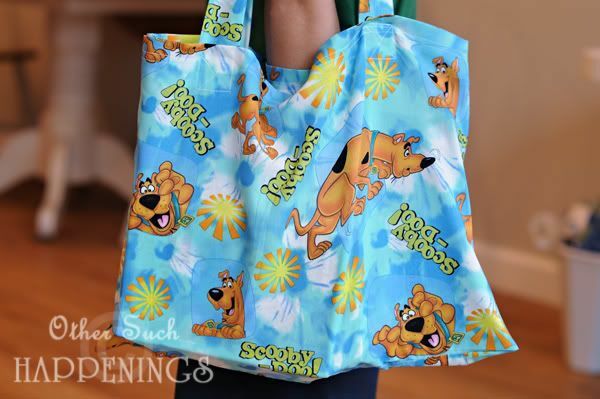 Right now they are using them for library bags, but I used regular cotton so it's not exactly the strongest material (esp the Scooby Doo one). Looks a bit bent out of shape, next time I'll try canvas. But they haven't broken so they just might work! All of your bags turned out great! I love the boys library bags or man bags or whatever . . . . I should do that for my boys. I just need to find some Star Wars material. Oh I love me a good tote bag. I can't get enough of them. Adorable gift bag. Nice bags! I wish I could sew, at least something. My husband won't be caught dead holding my purse. He'll let me set it at his feet and "watch" it for me. I don't even argue anymore. Your bags are cute! Glad your boys like them, too. 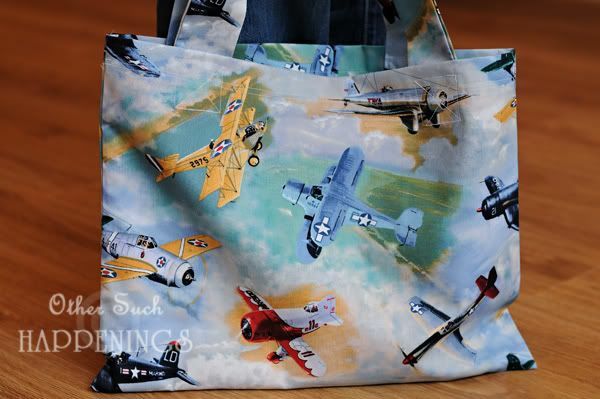 I love that vintage airplane fabric!!! The "x joints" are very professional. I am truly impressed. 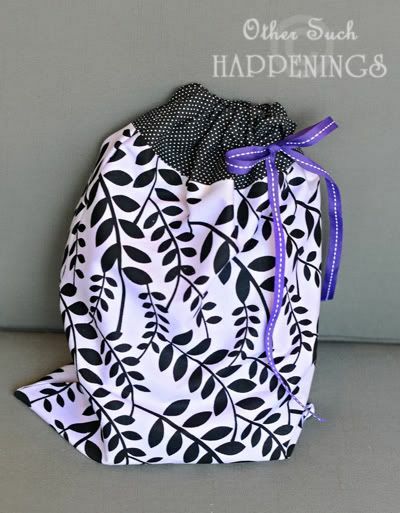 That purple/black fabric is really great. Fast forward almost two years later: His bag is indispensable to him. He takes in every morning to work and everywhere else we go. But don't look in it!!! Cords! Pens! Paper! Lip Balm!! Disarray!! And he's the coolest man I know! Keep up the good sewing work! ha! My husband is so jealous of women getting to carry huge bags, because they are so useful for carrying things! He is a fan of man-bags, but if I made it that would mess up the whole thing. Too cute. He prefers messenger bags, computer bags with straps, or a backpack. Whatever he's carrying at the moment, he refers to it as his "murse."